What happens when huge, dangerous machinery gets too hot? Catastrophe. Here in the industrial sector, we know that uncontrolled temperatures are an accident waiting to happen. Painstaking construction and careful monitoring of heat exchangers is the only way to ensure the safety of your personnel and the efficiency of your facility. MMI Tank and Industrial Services custom builds heat exchangers to suit the needs of your outfit. Put your faith in us and you won't be disappointed. 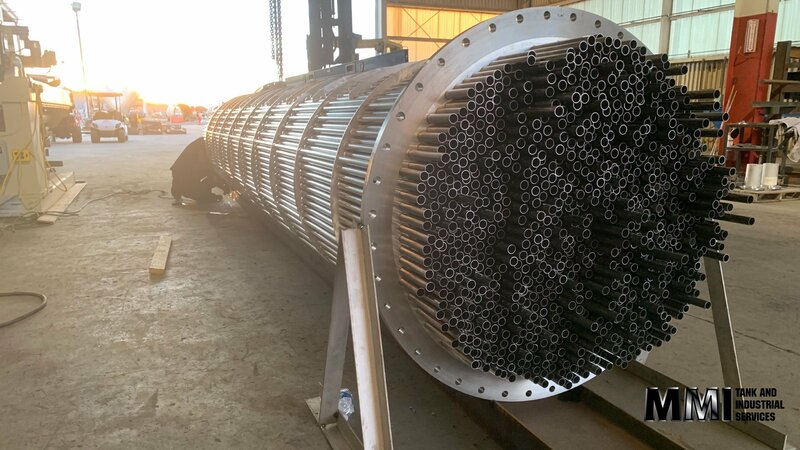 Whether you need direct contact heat exchangers or indirect contact heat exchangers, we can do that. Both types of heat exchangers transfer heat from one medium to another. The safety of this transaction depends on what is being cooled, and what is being heated. Direct contact heat exchangers bring the hot fluid in contact with the cold fluid, essentially mixing the two. If the fluids can be mixed and the temperatures coming into contact won't be disastrous, this is an effective way to transfer heat and keep temperatures at a safe level. If fluids cannot mix or the temperatures would react dangerously if the hot and cold came into contact, then the solution is an indirect contact heat exchanger. This system pumps the hot medium through one set of pipes and the cold medium through another set of pipes, keeping the two from ever coming into direct contact. The heat radiates from one set of pipes to the other, keeping both at a temperature that helps machinery to function safely. Where can Heat Exchangers be Used? Heat exchangers make it possible to indirectly heat solutions, as part of a chemical change in the medium. By running water or steam from your boiler, through a heat exchanger, your particular chemical solution can be piped through the steam or hot water (in a series of tubes etc., depending on the type of heat exchanger you need). The water or steam will continually cycle through the boiler and your chemical solution will be heated as needed without ever touching the water or becoming contaminated by (or contaminating) the boiler and other equipment. So, whether you need to have your heat exchanger repaired, moved and installed or even retrofitted in a new location, or if you’re ready to grow your facility and are looking for new heavy equipment, MMI is here to help you.